Established on September 27, 1988, the Chinese Cultural Center in the Republic of Benin is located at the Avenue Jean-Paul II in Cotonou City, with a floor space of 4,062 square meters. The building impresses people with rich traditional Chinese architectural styles. The center comprises an open air theatre, a grand multi-functional hall, various sized classrooms, a library for adult readers and a library for children. Under the support and joint efforts of the Chinese Ministry of Culture and the Benin Government, the Chinese Cultural Center was officially set up in Benin on September 27, 1988. 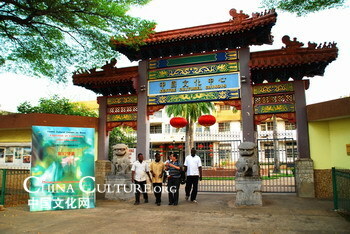 It was the first cultural center the Chinese government instituted in the African Continent. The cultural center is expected to serve as a platform promoting all-round cultural exchanges, following a ribbon cut at the opening ceremony under high concerns of all parties. The center furnishes a Chinese language course, a martial art course and a shadowboxing course. In addition, it frequently sponsors all kinds of cultural activities, such as book and artwork exhibitions, drama performances, concerts, and ceremonies commemorating students to complete courses. From time to time, it shows movies, DVDs and all sorts of documentaries on China. The center also offers rooms for Benin government organs and mass organizations to hold cultural and artistic education activities. When requested, the center will assist organizing exhibitions on China in other parts of Benin. On all accounts, the center assumes the mission of promoting Chinese culture and facilitating the prosperity of the African culture, particularly full flourish of Benin culture. The following is the channels to come into contact with the Chinese Cultural Center in the Republic of Benin.